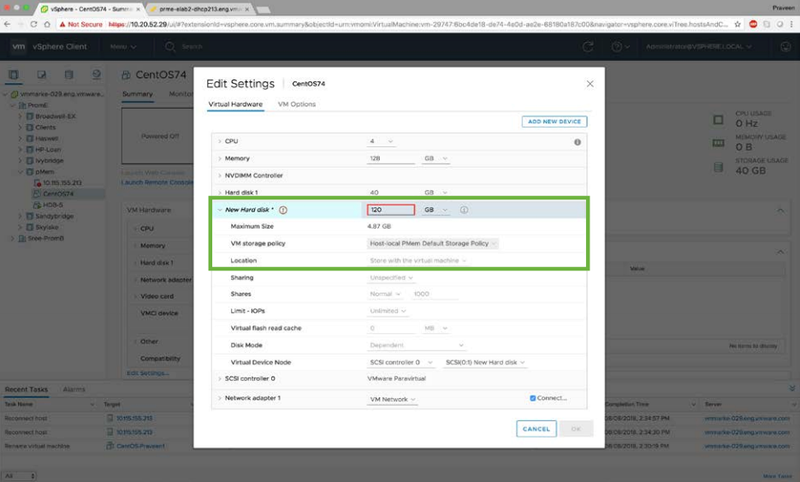 Persistent memory in VMware vSphere 6.7: what is it & how fast is it? 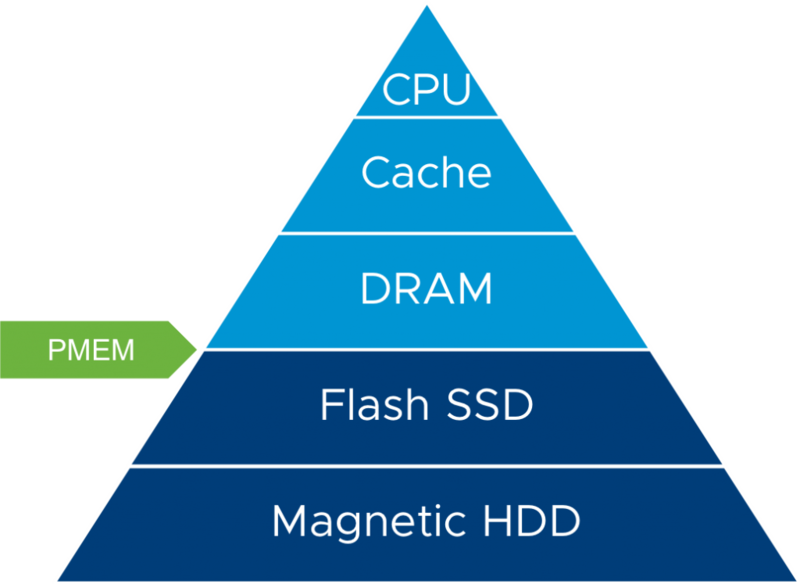 Persistent Memory (PMEM) support is introduced in the recently released VMware vSphere 6.7. This new non-volatile memory type covers the gap in performance between the random-access memory (RAM) and Flash/SSD. But, is PMEM really that fast? 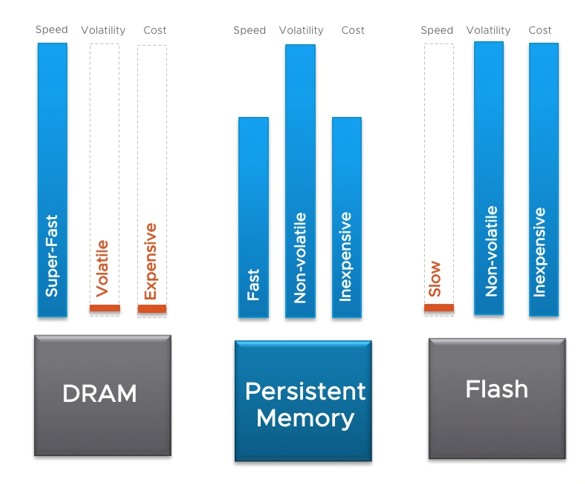 In this article, I take a closer look at what persistent memory is and its performance. What’s the difference between PMEM and any other memory type? Latency and bandwidth are close to DRAM. In other words, PMEM is approximately 100 times faster than SSD. For saving and uploading data, CPU utilizes the standard byte-addressable instructions. PMEM enables to avoid data corruption during device reboot or unexpected failure. Such properties, together with an ability to prevent data corruption in the event of storage failure, make PMEM disks the storage of choice for running heavy performance-hungry applications. For instance, PMEM can potentially be used for keeping high-loaded databases, real-time computing, and so on. NVDIMM–N (by DELL EMC and HPE) – DIMM devices that have both NAND-flash and DRAM modules on the single card. Data is transmitted between two modules during the boot process, power off or any event of power outage. Such DIMMs have a power supply from the motherboard to prevent data corruption. Currently, both HPE and DELL EMC manufacture 16 GB NVDIMM-N modules. 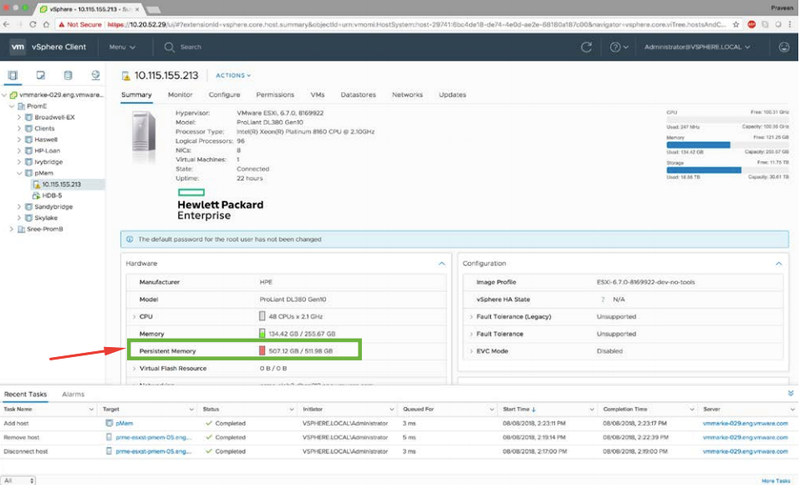 Scalable PMEM (by HPE) – cards comprised of HPE SmartMemory DIMMs, Non-volatile Memory SSDs (NVMe), and batteries which allow creating logical NVDIMMs. In these devices, data is transmitted between DIMMs and NVMes. Scalable PMEM technology can be used in devices with high PMEM capacity. 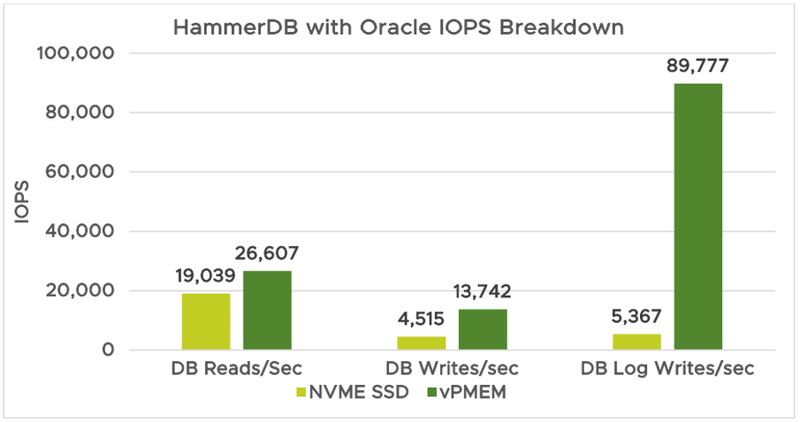 And, what also is important, virtualization with PMEM does not almost affect performance. These devices have only 3% virtualization overhead. Let’s compare NVMe SSD, NVDIMM-N, and other storage technologies performance. The table below provides you with some numbers. 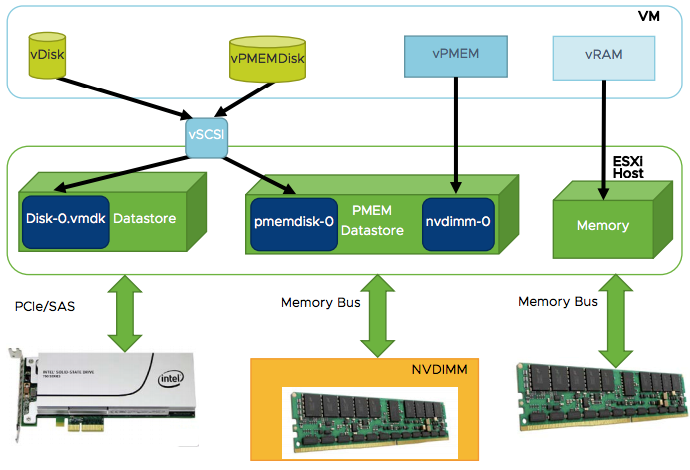 vPMEMDisk – vSphere presents PMEM to a virtual machine just as if it were a virtual SCSI device. There’s no need to change anything for the guest OS or applications. In this way, vPMEMDisk allows using PMEM in old operating systems and applications. 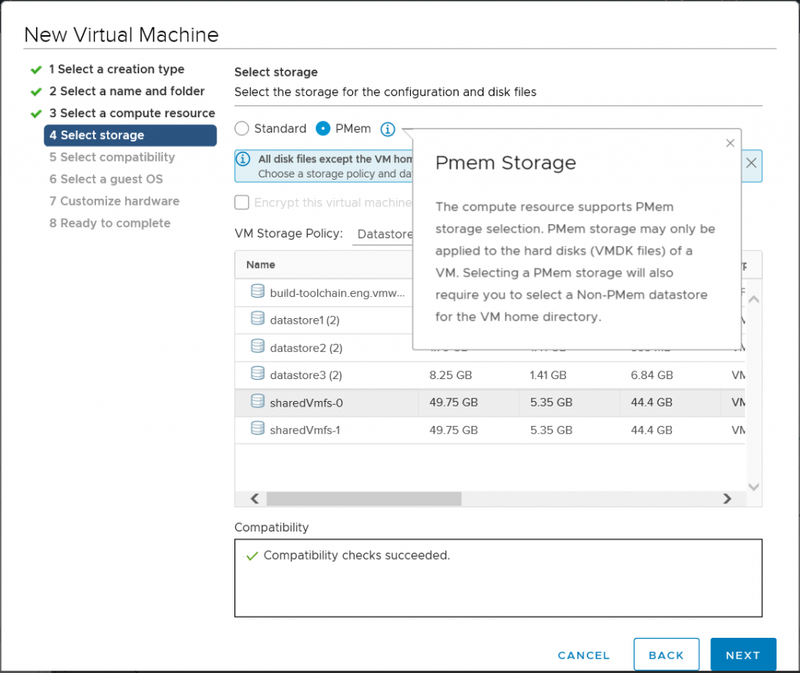 vPMEM – vSphere presents PMEM to virtual machines as an NVDIMM device. Most modern operating systems (i.e., Windows Server 2016 and CentOS 7.4) feature NVDIMMs and can present them as block devices or byte-addressable devices. Applications can access PMEM through the thin direct-access (DAX) file system layer or map the part of the device and obtain the direct access via byte-addressable commands. To use vPMEM, Virtual Hardware version should be 14 or higher. Also, note that at this time PMEM datastores are not displayed in HTML5 vSphere Client at all. Once you power on the VM with PMEM, vSphere reserves some space on that device. This space remains reserved for PMEM, regardless VM state (powered on or off). 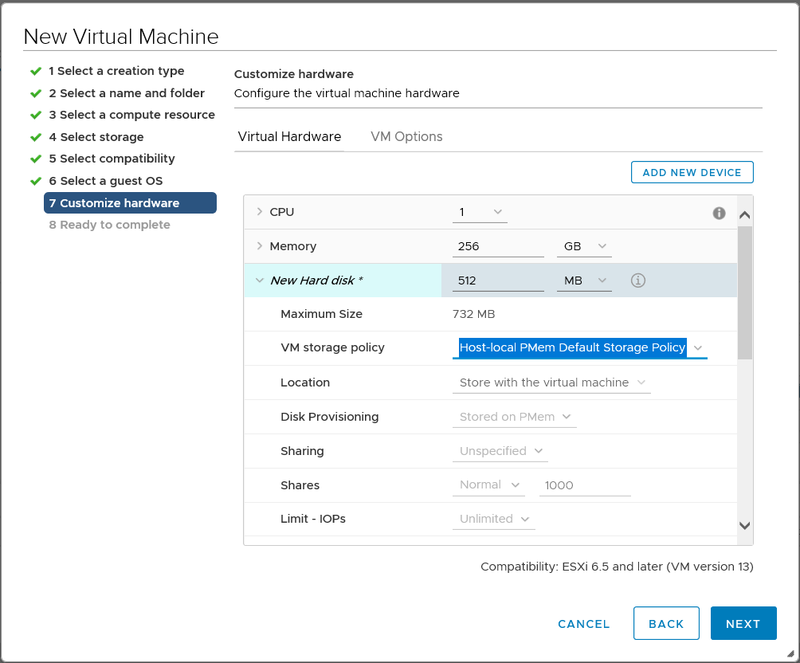 You can get rid of that reservation by migrating the VM or deleting it. Talking of VM with PMEM disks migration, the process highly depends on the type of the device used by the virtual machine. 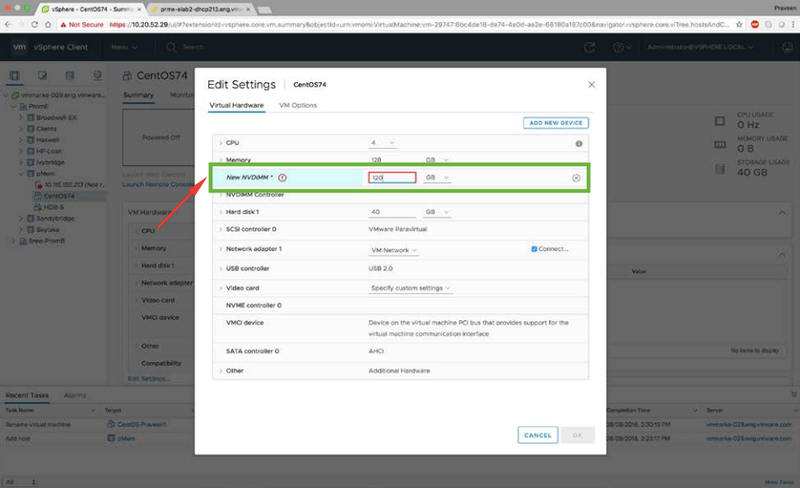 In general, for migrating virtual machines using PMEM disks between ESXi hosts, both vMotion and Storage vMotion are used. On the PMEM device of the target host, there should be enough space for the virtual machine’s PMEM storage. At this point, note that you can migrate the virtual machine with vPMEMDisk on the host without PMEM devices, but you can’t do that with VMs with vPMEMs. VMware DRS and DPM fully support PMEM. Still, DRS mechanism prevents you from migrating a virtual machine using PMEM to the host without the PMEM device. What about PMEM devices performance? Now, let’s look at how fast PMEM can go! 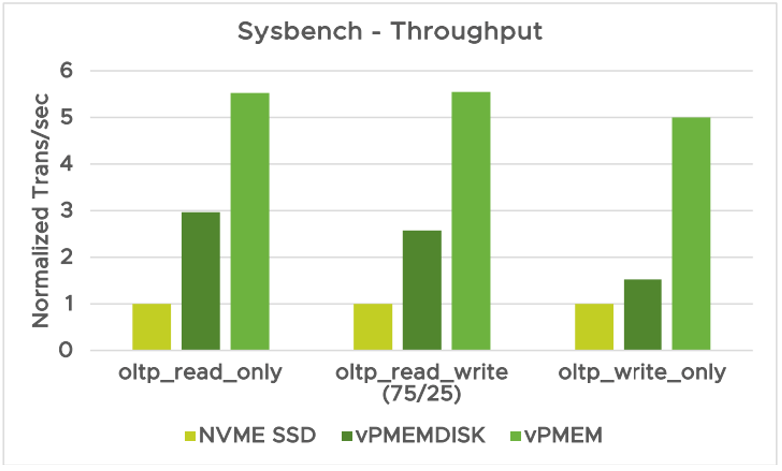 VMware has recently tested PMEM with numerous benchmarks. 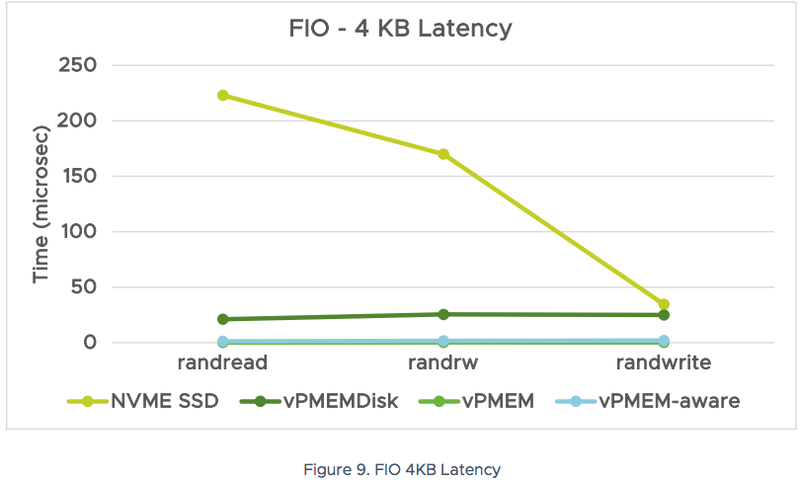 Study results are available in the Persistent Memory Performance on vSphere 6.7 – Performance Study document. Here are some plots from that report. vPMEM-aware – Guest OS can work with PMEM via the direct access. In this article, I discussed how PMEM works and provided you with some numbers regarding its performance. This technology is a true middle ground between the fast but volatile DRAM and slower but non-volatile Flash/SSDs. For more details check out the performance report itself. More details about using Persistent Memory in VMware vSphere 6.7 are available here and here.